If you are a free agent and really want to improve your skiing, and you don't mind roughing it a bit, the world is very much your oyster. Working a ski season or "being a ski bum", for most people, is all about getting in a lot of skiing that would otherwise be too expensive. For others it can be a fun way to fill the winter months of a gap year, meet new people or a chance to explore different career options. There is a good selection of ski season jobs, from managerial positions to working as a ski instructor, ski rep, chef or barman. Do not overlook the possibility that what starts out as a way to get free skiing can lead to a career as a chef or a manager in resort accommodation. If you want to learn the language, remember it will not happen unless you work with local people. Veteran seasonaire, James Young, has spent eight winters in the alps and can't recommend it enough: "I decided to get a ski season job to improve my skiing and by the third winter I was a qualified instructor. It's not just the skiing that appealed to me though, I met lots of like-minded people including my wife and also managed to pick up Italian." The first thing is to decide is where you want to go. 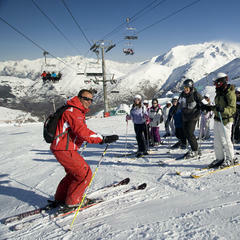 For Brits, France is the most popular destination to get a ski season job. North America is difficult because of the visa problem and a lack of jobs at the moment. True, it is possible to use your initiative. Sabine Harneis who did a season in North America told OnTheSnow it can be nerve-wracking: "I used to get stomach pains going through immigration and you had to be very careful what you carry with you and make sure it fits in with your story. No family photos and letters saying darling I am going to miss you so much, when you are supposed to be staying for only two weeks." Once you have decided where to do a ski season, you have to be clear about what you have to offer an employer – experience, languages, a cooking qualification or of course an instructor's qualification. 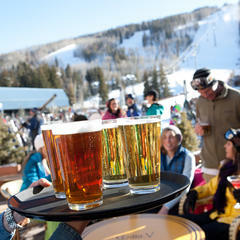 The best ski season job for skiing is at night or in the evening – bar or restaurant work. You can catch up on sleep when the season is over. 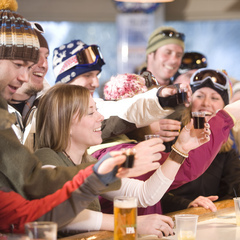 Being a ski rep for a tour operator is the near ideal way of getting time on the mountain, skiing with clients, and be on the customers' side of the bar in the evening. The internet is a good place to start looking for ski season jobs or talk to friends who have already done a season. Betony Garner press officer at the Ski Club of Great Britain told OnTheSnow: "There are many ski season jobs in hotels and catering that are not well paid but you get to spend a season or seasons on the slopes. On the other hand qualified instructors do well especially in resorts like Meribel and Val d'Isère where the many British skiers appreciate the lack of a language and even a cultural barrier." Working for a well known company like Ski Esprit, Crystal Ski or Equity, who have been around for years, will always pay your season's ski pass, accommodation, and some meals too. Remember that accommodation provided for resort workers is not luxurious and you will not have room for much stuff. If you fly out then the baggage limit will affect you as well. It is a pretty informal job market place and first-come first-served is the rule although application forms have to be properly filled in. You should apply in May for the next season although there will always be jobs later on. Sabine got her first job at Christmas when someone broke their leg (lucky for Sabine at least). Make sure that your ski season job actually allows you skiing time. Don't forget a day job will keep you busy when the ski lifts operate unless you have previously agreed arrangements to take time to ski. For most young winter sports fans there is only one way to spend some decent time on the slopes and that's to 'do a ski season'. May: The big destinations and big companies recruit for the coming winter. September: Is a dead month for recruitment between seasons. October: The smaller businesses take on staff. The bosses are back from their September break and have to staff-up for the coming season before Christmas. New Year: By now, employers or employees may have decided they wish to go their separate ways for all sorts of reasons. On top of that vacancies become available all the time through accidents or illness. So keep looking. Especially for your first ski resort job, persistence is vital. For first-timers, the destination is less important than actually finding a job, as long there is some snow and your job allows you time to ski. You need to be honest with yourself – why would an employer chose you out of dozens of other applicants? What have you got to offer? Are you a qualified ski instructor, chef or do you speak more than one language? 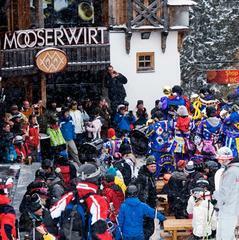 Be aware that it is better to have a ski season job where you work after the lifts close, in a restaurant or bar for example. 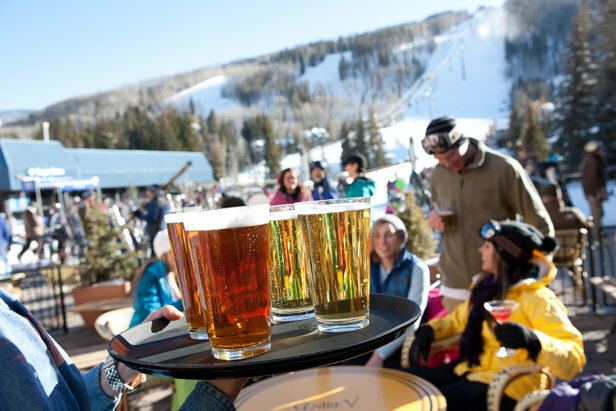 Obviously the ideal is to land a job as a rep with a travel agency, then you can ski all day with your clients and prop up the bar all night. The reality is that to start with you are more likely to be doing the dishes in a restaurant kitchen. According to the French online seasonal employment agency seasonbuzz.com, the most sought after staff are still those able to fill the posts of chefs, bar/waiting work, shop assistant, group organisers, ski reps and hotel staff. On the positive side, bear in mind that what starts out as a way to get free skiing can develop into a real career in the hotel and catering industry or in the ski industry. Vicky Norman of the Ski Club of Great Britain says, "There is a definite demand for native English speakers to cater for English families linguistically and culturally. This is not necessarily to the taste of the locals but they are getting used to it." Generally a bad idea. First of all it is illegal and most important you will not be covered by insurance or entitled to treatment through the local health service if anything goes wrong. Rule 1 - No spelling mistakes or typos. I assure you we still get a lot of CVs with bad spelling mistakes. If you are not natural Oxbridge material on paper get someone reliable to read through your CV. Rule 2 - Give your CV a good headline. Remember harassed employers will be going through dozens of applications. Make yours stand out with a headline that sums up why they should choose you. Draw attention to your skills but don't get carried away. Rule 4 - Make sure your CV is logically planned usually in chronological order or as a list of what you can offer (most recent first). Rule 5 - One page only! You have not been around long. No need to ramble on for pages. Rule 6 - Personalise your CV for each job application. Don't send the same CV for two different jobs. Yes it takes a bit of time but it is the key to a successful application. Rule 7 - Moderation. Do not use more than two colours, avoid eccentricities; be clear, brief and precise. Rule 8 - Send an accompanying letter in the same email as your CV. Try to be persuasive and generate interest.